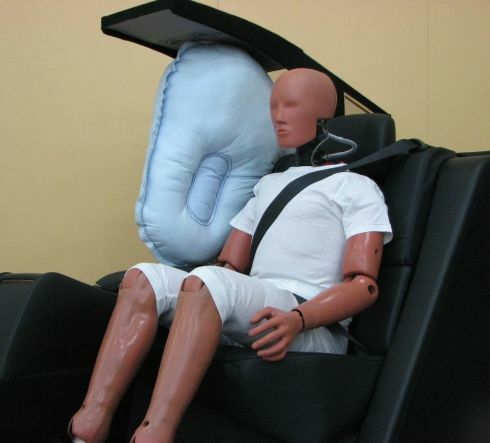 (Tokyo) — TOYOTA MOTOR CORPORATION (TMC) announces it has developed a Supplemental Restraint System (SRS) rear-seat centre airbag—the first in the world—to help reduce the severity of secondary injuries incurred by rear-seat passengers in a side-on collision. The new airbag is fitted in a large, fixed, rear-seat centre console that comes in a version of a Toyota model to be launched in Japan in the near future. When the vehicle is hit side-on, the airbag deploys from the top of the console to act as a barrier that helps lessen injuries caused by passengers colliding with each other or into the console. TMC has continued to actively develop and make available its collision safety technologies—including its early commercialization of SRS curtain shield and knee airbags—to enable its vehicles to better respond to a wider range of accidents. TMC, as a part of its efforts to realize sustainable mobility, intends to strengthen its traffic safety initiatives in the future through: 1) the development of even safer vehicles and technologies based on TMC's Integrated Safety Management Concept, 2) participation in the creation of a safe traffic environment, and 3) activities designed to teach people about traffic safety, thereby contributing to the complete elimination of traffic casualties, which can be viewed as the ultimate hope of a society that values mobility.